SINCE the release of this outstanding album a couple of weeks ago, I have purposely held back (until now) from publishing any kind of review – indeed, this may not be what I would write a month, or even a year, from now! Why? Because ‘Yatra’, translated as ‘journey’, is very much that – a fascinating and varied sequence of originals which gradually, on closer examination and repeated listening, reveals the intricacies and ingenuity of its writing, arranging and playing. 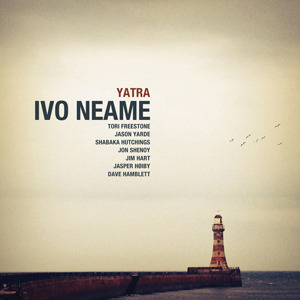 Ivo Neame’s profile and reputation has undoubtedly and unsurprisingly risen to great heights – now firmly established as a leading pianist on the UK contemporary jazz circuit with his distinctive, individual voice being a key element in the sound of Phronesis, Kairos 4tet and many others. This third album of Neame’s demonstrates his skill as leader, and in writing for eight parts, with a star-studded line-up which includes the superb bassist Jasper Høiby, much-in-demand Jim Hart on vibes, and a dazzling quartet of free-thinking reeds players including the talented Jason Yarde and Shabaka Hutchings. The diversity possible within this collective takes us from jazz quartet almost to big band, with some superlative soloing, too – and, seeing them perform numbers from this album recently, at Kings Place, London, confirms the live experience to be at least, if not more, as enthralling. The title track sets the pace for the album’s intoxicating energy and bustle, with its complex rhythms, led by Neame’s always-authoritative piano style, plus characteristic sparkle from Hart’s vibes. Halfway through, the wind quartet breaks off for a great ‘conversation’ of their own – written or improvised, it’s lovely stuff! Two pieces from Phronesis’ latest album ‘Walking Dark’ (Edition EDN1031) – ‘Charm Defensive’ and ‘American Jesus’ – are given the octet treatment, the latter displaying a wonderful restlessness, with Neame’s accordion and the flute of Tori Freestone providing great energy. ‘That Syncing Feeling’ changes the mood with beautifully measured pace and depth, before ‘Owl of Me’ crazily bursts in with mocking, anarchic brilliance, courtesy of Jon Shenoy’s clarinet and the ever-present colourful drumming of Dave Hamblett. And so ‘Yatra’ continues with increasing inventiveness, and accomplished soloing always supported by integral ensemble playing. A distinguished production from Neame, bringing something new to the current wave of homegrown jazz excellence, and leaving us with the intriguing prospect of which creative direction he will take us in next time! Beautifully recorded and produced, as ever, by Edition Records.